Mark Twain and Childhood Homes – Some things DO stay the same! 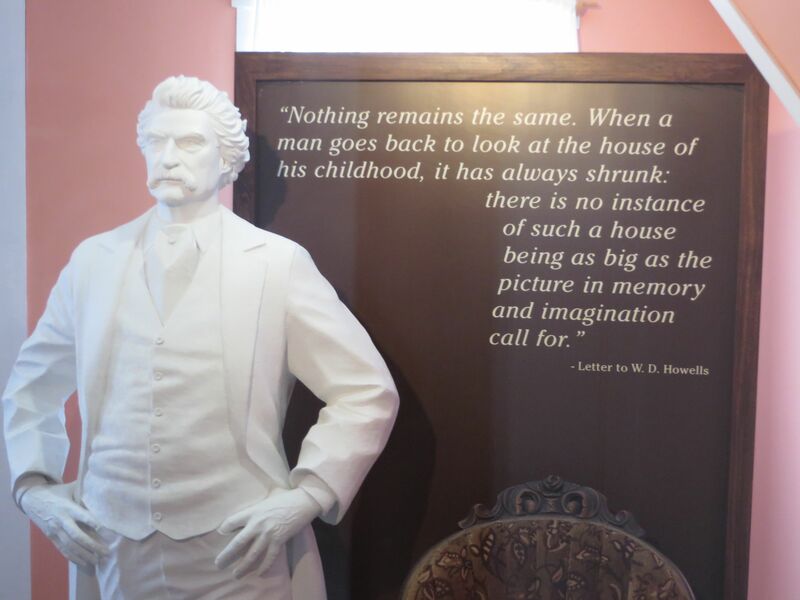 As I passed through Hannibal, Missouri, on my recent cross-country trip, I visited Mark Twain’s boyhood home. As I was on my way back to my own childhood home in Newtown, Connecticut, I was struck by this poignant quote. Of course, I had never “left” my hometown as my parents had always lived in the same house that I grew up in and I visited many times a year. So, the house looks the same as it always did. What else is the same? I’ve pondered the question and have come up with a few things. 1. The weather! It rained most of the day today, complete with thunder and lightening. There’s nothing like a summer (okay – I know that Labor Day marks the end of summer) rainy day. I have always loved the sound of raindrops hitting the roof and stone walkway. 3. Local traditions! I attended the Newtown Labor Day parade today. The parade is a local tradition and I was fortunate to watch the 2013 festivities with two friends from high school that had also grown up in Newtown. I’m happy to report that the next generation is enjoying the parade as much as we 40-somethings did many, many, years ago. 4. Family habits! I came home from the parade to find one of my father’s tractors abandoned in the middle of the front lawn. My father has a small fleet (currently the count is 3) old tractors that he uses for lawn maintenance. He never has more than one working at any given time and the old machines regularly quit or get stuck (due to my dad’s expectation that he can drive them through mud). Yup, some things never change and Dad’s tractor had stalled in the front yard for no apparent reason. Guess who had to push it back to the barn?? I don’t know what Mark Twain would think of Hannibal, Missouri, today, but I’m happy to report that my childhood home still possesses much of the charm it did when I was young. If anything it seems a bit bigger. However, that might be due to the fact that I’m the one that now does the vacuuming. « Finding the rightful home for lost artifacts…in England, the Metropolitan Opera in NYC, and Virginia!